[Adapted from my post for Physicians Practice] Generally speaking, physicians make good money while in practice. Many of them are in the top tax brackets. Upon retirement, however, their earned income often drops to zero. If they can defer some of their compensation to the future, they can effectively move money from the top tax brackets to lower tax brackets. Take a physician couple who made $400k in AGI, for example; their federal income tax would come to be $110k using 2010 tax rates. If they could defer $150k until after retirement, their federal income tax would be reduced to $60k, an immediate tax saving of $50k. Of course, the tax on the $150k is only deferred until the money is taken out. When that happens, the tax on it will be $30k. So by deferring $150k in compensation, they would realize a net tax saving of $20k. If tax-free growth and time value of money are taken into account, the benefit would be far more. And that’s for only one year of income deferral. While talking to CPAs and tax attorneys in my network of specialists, the common refrain I heard is that physicians are forgoing much of the benefit by being careless about their retirement plans. For physicians in a solo or small group practice who are in their 50s, a defined benefit plan could potentially enable them to put aside $150k or more into the plan, more than three times the SEP IRA limit. 1. They don’t have age-weighting or cross-testing features that optimize the principals’ tax saving. 2. They have huge hidden costs. A survey by Deloitte has found the average all-in fees for a 401k plan with less than 100 participants is 2.03%. A “large” physician practice that has 20 employees is likely to pay far more than that. 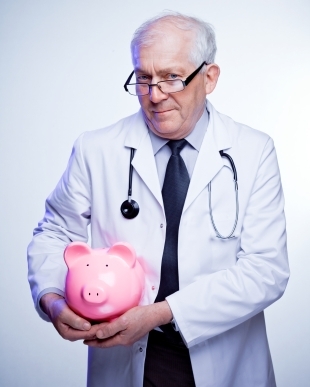 Whatever money the physicians save in taxes they pay in fees and then some. What should a physician do? Get an expert second opinion on your retirement plan. You owe it to yourself. If you don’t know any experts, schedule a discovery meeting. 2 Responses to "Physicians’ Most Costly Missed Opportunity in Tax Saving"
Also, if earned income can be reduced to zero – which requires some planning in terms of structuring investments and getting tax free monies to live on – it presents an excellent opportunity to make a series of Roth conversions. I like the phrase “discovery meeting”. This is an article I wrote for Physicians Practice. Since then I have some second thought. For physicians in small group or solo practice, most of them just use a SEP IRA. I thought they should set up a DB plan (if they are old enough) to maximize their income deferrals. What do you think? Here is the dilemma, they will most likely drop down a notch or tow in their tax brackets in retirement, but the tax rates might increase.